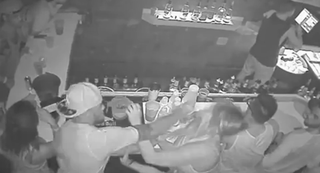 Police charged Florida State quarterback De’Andre Johnson with battery last month after he allegedly punched a woman in the face at a Tallahassee bar. Legally, it’s still “alleged,” but today the state attorney’s office released a portion of the surveillance footage. It does indeed appear to show Johnson punching a woman in the face. According to records, the woman was waiting to order at the bar when Johnson tried to push past her. When she confronted him, he grabbed her arm, she swung, and he punched her in the face. Florida State placed Johnson on indefinite suspension when the initial report came out. Update (9:45 p.m.): Florida State has dismissed Johnson from the team.